Graduate students have the opportunity to participate in a variety of graduate student organizations, student governance, intramural sports, and professional development activities. In particular, the Graduate Student Assembly (GSA) is the multidisciplinary graduate student organization on campus dedicated to promoting and supporting research and professional development for graduate students at Wright State. In addition, Wright State boasts 15 NCAA Division I men's and women's athletic teams with students receiving free admission to each event. 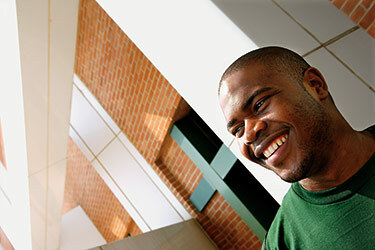 The Graduate School is a customer-oriented center for all persons interested in graduate study at Wright State University, as well as for current graduate students. As you continue your academic career with us, we hope the links provided on this page will lead you to information that will assist you. In addition, we hope that you will continue to keep close contact with your academic advisor, program director and the Graduate School in order to ensure that your educational journey goes smoothly. If you really want to know what’s going on at Wright State, you have to live here! By living on campus at Wright State you become a part of the Raider community and get to know other students from all walks of life. At Wright State, living on campus is all about options. Adult students can choose from our featured apartment communities: College Park and The Village. Ready to live on campus? Apply for housing once you have been admitted. For educators interested in learning about Peer Instruction, the Office of Medical Education at the Boonshoft School of Medicine will offer a workshop on May 15. Hundreds of Wright State students and alumni attended Career Fair 2019 Spring Semester in the Student Union March 19, eager to meet business recruiters looking to hire them. The Wright State men's basketball team played in its first-ever NIT at Clemson, pushing the ACC team but falling 75-69. Pepsi will donate a portion of the proceeds of every Pepsi product sold in Hospitality Services locations through May 3 to the Pink Ribbon Girls. The Wright State women's basketball team will open the NCAA tournament against Texas A&M at College Station, Texas, at 4:30 p.m. March 22.